Purchased iwatch3 a couple weeks ago. Updated to latest ios on both watch and iphone 7 plus. Love breathe feature. However, the automatic reminder feature does not work. Anyone have a similar experience and fix ? Software glitch with newest ios ? 1. It’s an Watch, not an i-Watch. 2. You updated the Watch with watchOS and the iPhone with iOS. 3. 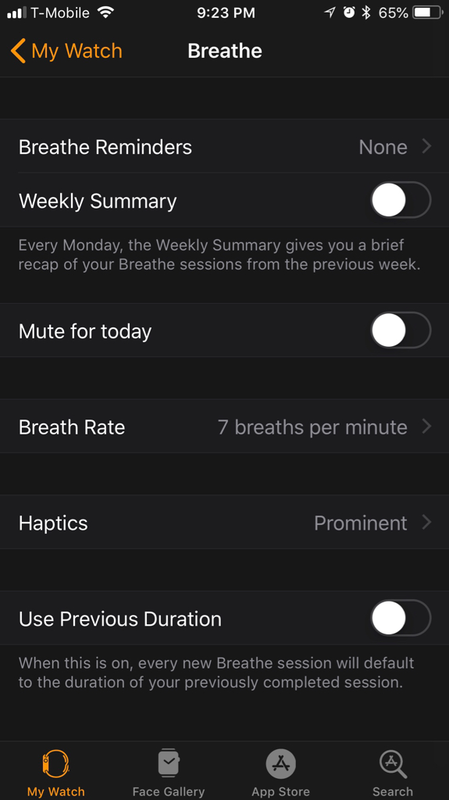 I agree that the breathe reminder is an excellent feature on the Watch, however, what automatic reminder feature are you referring to? I'm sure it's Watch app/Breathe/Breathe Reminders - x times per day. Mine happen sporadically, but I really don't use the app all that much anyway. Oh okay. I understand now. Thank you. The reminder feature does work. It kept going off every day, so I had to disable it. Just look in the watch app on your phone for the Breath settings. Then you don't understand exactly what the Watch is doing or expects. After an updated a while ago my breathe reminders despite being set for a certain # of times per day only shows up like per day, I actually have gotten used to not having it. annoying, likley due to some quirk but if you reset you lose all of your achievements and I have hit quite a few. Apple is so much better. I haven’t worn a regular watch in 5 yrs. Samsung 3. Apple Watch will be wearing 3 yrs in January. The medical community is impressed too. I have seen on the news how Apple is changing how they look at the smart watch and what it can do.